While I met lots of people in Merida, no one was traveling to my next stop, so I jumped on a morning bus to Valladolid solo. I just enjoy saying the name, Vah-yah-doe-leed. 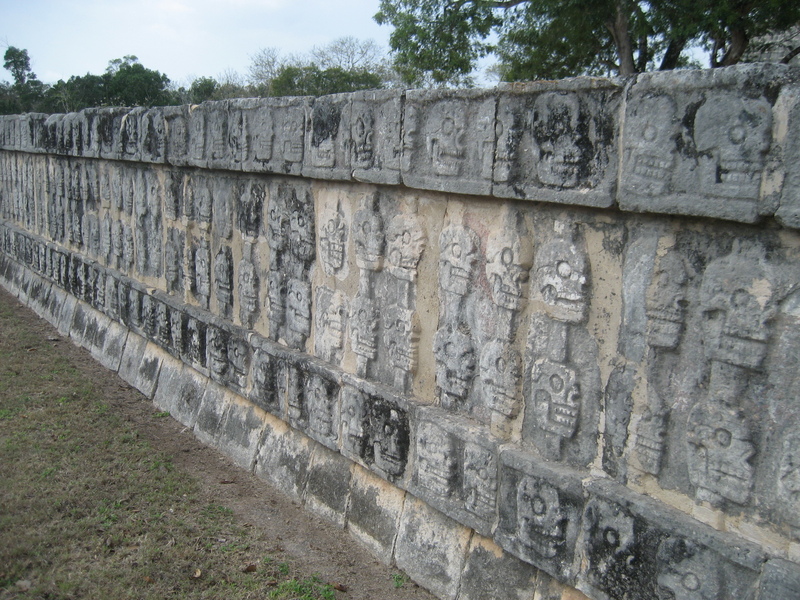 It was a short hop to my second Yucatan city and easy trip. As the bus passed through the smaller towns, children used it to get home from school and vendors popped on to sell bags of popcorn, french fries with spicy red sauce, and chicherones. After taking a wrong turn coming from the bus station, I made it to my hostel a little grumpy. 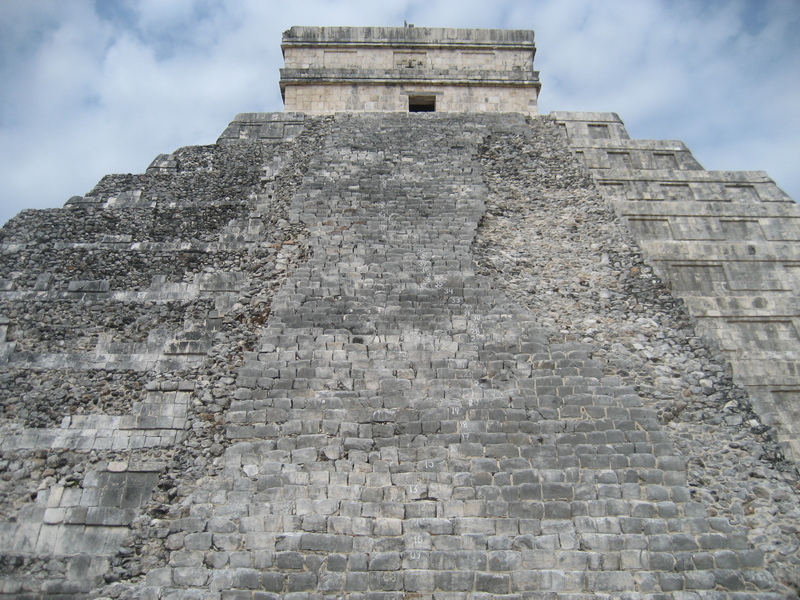 But the moment I entered the female dorm–and I mean this literally; my foot *just* over the door threshold–I was immediately befriended by a German woman perched on the far top bunch who invited me out to dinner and Chichen Itza the next day. She and I turned out to have a lot to talk about: travel (she’s nearly 200 days into an intended 2+ years abroad, coming via Africa and South America, headed to Australia), both turning 30 this year, relationships, careers, decisions, and a mutual love of fantasy novels. 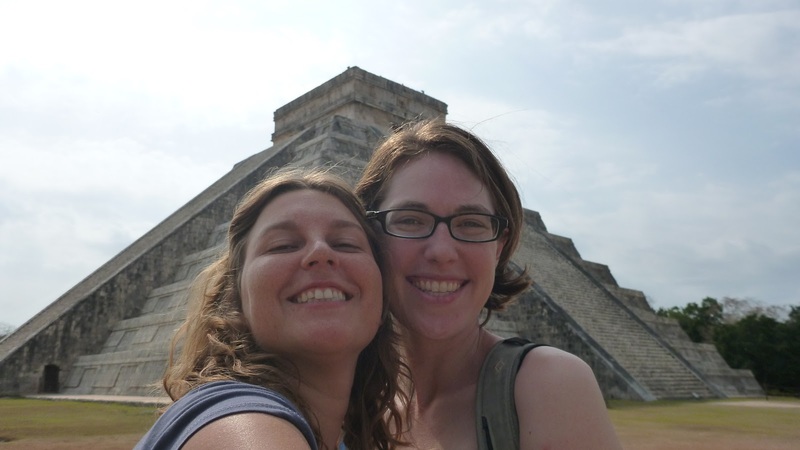 Taking her up on her invitation, we headed to Chichen Itza early the next morning. The main pyramid is beautifully restored (well, one side anyway) and when you clap in front the echo makes a noise like a laser gun from a scifi movie. Over all the complex was enjoyable to walk about, but it didn’t make me feel very much. It’s a big name, historically important, and I’m glad I went, but as a traveler it didn’t particularly strike me. Duo self shot photos are even harder than singles! That night, after grocery shopping for the next few days and cooking a pasta dinner for two, I bonded over Bond movies with a Canadian soon-to-be firefighter and tagged along with him and his sister the following day to the cenotes (more on this later). Not very shy about inviting myself along on other people’s adventures; seems to work and most often (100% so far) fun ensues! Temporary traveling friendships feel kind of like training wheels for casual dating. You have to keep yourself open to possibilities, hang out in social places, put yourself out there, and be assertive enough to make spending time happen with people you like. Everyone is different, with different traveling styles in the mix too, and you have to decide if you want to spend more time with them based on a first impression. Of course it’s easy with lots of possibilities here; everything is temporary and most people are receptive to making new friends at least in the short term. So far I’ve been delighted with my day trip partners, all for different reasons, and am enjoying the variety of company. This entry was posted in Central America, Cultural, Mexico by ladyasatramp. Bookmark the permalink. Its John from Vah-yah-doe-leed, I just found the blog. Me and Anna saw you leaving for the bus about a block away so we just missed saying goodbye. I thought I would write a lil note saying thanks for joining us for the cenote trek and good luck in a your adventures. Oh and great job on the blog. Keep it up, you have an obvious talent for writing! Buen viaje! Aw, hi John! I looked around as I was about to leave and was so sorry I missed saying goodbye to you two, so am glad you found me. It was a pleasure to meet you too; thank you for 'adopting' me for the day! I've got a post about the cenote trip in the works, complete with a video of you on the rope swing, so stay tuned. 🙂 Good luck with everything back home, and take care!